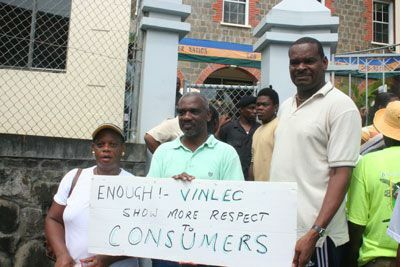 Bacchus, speaking at the end of his groupâs third march on the St. Vincent Electricity Services Ltd. (VINLEC)âs headquarters in Paulâs Avenue, said that members of the RRU, also called âBlack Squadâ, were disrespectful to the protesters. âI am requesting publicly that the police do not send the Black Squad officers any time there is a peaceful demonstration of this nature. They are aggravating the public with their comments and facial expressions and are not helpful to the cause,â Bacchus said. When asked, Bacchus claimed that the officers, who are usually attired in black clothing, used obscene language and threats against the protesters, who Bacchus said were exercising their constitutional rights. In 2002, the Rapid Response Unit was formed, according to Assistant Superintendent of Police Eric Browne, to deal mainly with emergency police matters. Browne, who is head of the Unit, when asked by SEARCHLIGHT about the incident, indicated that he had not heard of any conflict between protestors and officers on Friday. Browne indicated that his officers are no different from officers in other departments, whose main objectives are to preserve peace, prevent crime and control traffic, inter alia. Bacchus acknowledged that police officers from other units who were present behaved orderly and were respectful and understanding, but the RRU officers, he said, were intimidating. âThe officers in the Black Squad had clearly demonstrated their attitude has been hostile and repugnant to the people who were exercising their constitutional right,â Bacchus declared. âThe Black Squad is to go out and deal with violent crimes, drugs and so on. They are not to deal with peaceful Vincentians,â he said. The Unit is currently stationed at six areas around St. Vincent and the Grenadines: Layou, Chateaubelair, Prospect, Kingstown, Owia and Union Island.